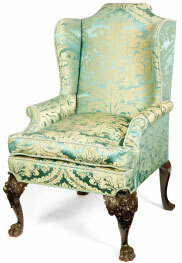 Pietro Bossi was a scagliola and stucco worker who was active in Dublin in the last quarter of the 18th Century. It is thought that he may have been related to the Bossi family of Stuccodores from Como, in Northern Italy. 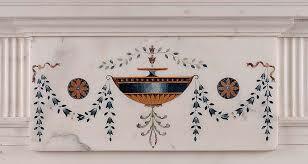 Bossi worked in marble and scagliola inlay. An example of what exactly scagliola involves is covered by Kennedy Design Studio in Shropshire England where they have defined scagliola as Originating in Bavaria, it was used for the first time in the Munich Residenz by an artist called Fistulator who created a number of figurative inlaid panels set into the walls of the chapel. After this the craft seems to spread to Italy, where it really took off in the17th Century. It was used initially to copy the hugely expensive work done in Pietre Dure inlay, and then to create the enormous marble-like columns and architectural features that we see in our grandest buildings throughout Europe. Bossi has a number of table tops attributed to him in the Etruscan manner. The red figure madallian relate to those on one of his chimneypieces which is in situ at Charlemont House (Dubin City Gallery also known as ‘The Hugh Lane Gallery’) and also at Castletownshend Co Cork. Both of these chinneypieces are attributed to Bossi. It is generally thought that Bossi work and his madallions were inspired by William Hamilton from his catalogue of Etruscan, Greek and Roman antiquities from the Cabinet of the Hon W. Hamilton by Baron Pierre Hughes. In respect of the marble top tables, they are said to have been in the collection of the Dukes of Leinster thus they were either in Carton or Leinster House. The Leinster tables are possibly referred to in a Saunders Newsletter dated to 22 March 1786. The sales description from is as follows, “Peter Bossi, Inlayer of Marble, lately removed to no. 38 Fleet-street, has now for sale an elegant pair of statuary marble tables, also chimney pieces to be as good workmanship as any done in London. Apply as above.” Finally, a recent discovery in the Papers of Aldoborough House revealed an eetimate was issued by Bossi for services of stucco and plaster work. The superb scagliola work of Pietro Bossi, remains some of the most desirable and collectible of Irish 18th Century decorative arts. His work continues to reach staggering prices at auction both at home and abroad. It is interesting to also note the foreign influence felt in Dublin during the Georgian period and the lasting effect they have had on the aesthetic of this small outpost of Western Europe. This entry was posted in Antiques. Bookmark the permalink.